Earlier this summer I released a “Building Applications with Aurelia” course on Pluralsight. I’ve enjoyed working with Aurelia since the early days and seeing how developers combine Aurelia with other frameworks and libraries. You can follow the latest news, too, by watching the Aurelia blog. I still don't see why this is revolutionary compared to a framework like angular.js which works (more or less) with the same kind of concepts. @Adz: Modules make for a much different architecture, that's what I'd say about both Aurelia and Angular 2. I went through Building applications with Aurelia course.It is a great introduction to Aurelia. U are my favorite Author Scott. 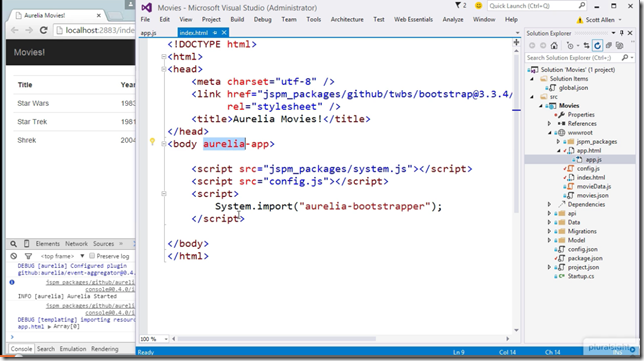 Can i expect advanced pluralsight course on Aurelia Framework from U And AngularJs 2.0 - Getting started?